Glamorgan: Aberafon, Baglan, Higher, Baglan, Lower, Blaengwrach, Blaenhonnda, Britonferry, Clyne, Coedfrank, Duffryn Clydach, Dylais, Lower, Dylais, Upper, Glyncorwg, Kilybebill, Llanguick, Higher Llansamlet, Lower Llansamlet (2), Llantwit, Lower, Margam (2), Upper Michaelstone super Afon, Lower Michaelstone super Afon, Higher Neath, Lower Neath, Middle Neath, Neath parish and town (3), Resolvend, Ynisymond. Brecon: Higher Ystradgynlais, Lower Ystradgynlais (2), Ystradfelte. The population falling within the Union at the 1831 census had been 23,768 with parishes ranging in size from Higher Baglan (population 58) to Neath itself (4,043). The average annual poor-rate expenditure for the period 1832-35 had been £7,403 or 6s.3d per head of the population. In 1875, a new Pontardawe Poor Law Union was formed which included some of the parishes which had previously formed the north-west part of the Neath Union. 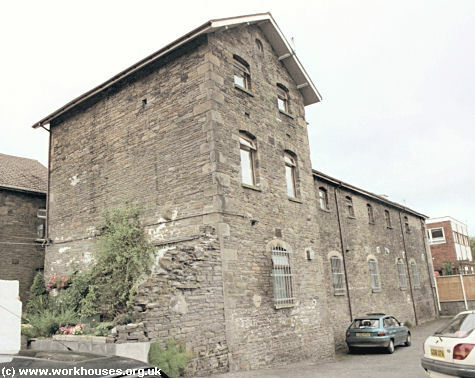 The Neath Union workhouse, opened in 1838, was built about a mile the east of the town on a narrow site the north side of the Llantwit Road, backing onto the Neath Canal. In 1895, it was described as "a substantial building of stone, erected in 1838 & since rebuilt and improved, adapted for the reception of 140 poor & has a well-furnished boardroom". Its location and layout are shown on the 1899 map below. It was an H-shaped layout comprising a long front range, later extended to the west, connected by a short central block to a parallel range at the rear. The dining hall was located at the centr of the rear wing. Only the eastern half of the building still exists. Neath front range from the south, 2000. Neath rear range from the north-east, 2000. Courtesy of Lletty Nedd residents. © Peter Higginbotham. The workhouse had severe problems with its water supply. Although there was a well in one of the yards, some water had to be fetched in buckets from a spring in Gnoll Woods. In 1870, the situation was so bad some of the cooking was being done in canal water. In 1871, the death of a child at the workhouse was prominently reported in the local press. A pauper named Elizabeth Ann Thomas had entered the workhouse on 12th April and had given birth nine days later. The workhouse medical officer, Dr Stephens, was not a Welsh speaker and his dealings with Elizabeth Thomas had to be translated by the workhouse nurse named Jenkins. He had not come to his attention that Thomas had a number of sores on her bodyand was in fact suffering from syphilis. On August 1st he was called to examine the child which had been weak and delicate with ongoing discharges from its nose and ears. When he separated the child's eyelids "a quantity of matter flowed out but the sight was gone". The child died a little while later. An inquest jury returned a verdict of death from syphilis. 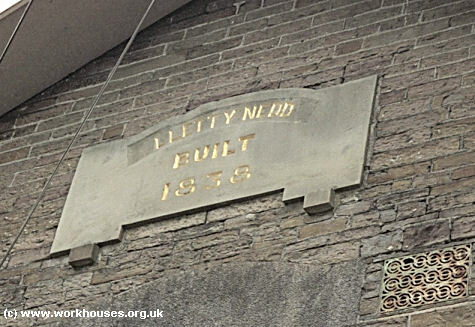 In 1918, the Guardians decided to adopte the name "Lletty Nedd" (or "Neath Lodgings") for the workhouse. The name was added to a plaque on the frontage of the building. In 1922, the matron, Mrs Mills, dies after 49 years working in the Poor Law system. She was succeeded as matron by her daughter, Miss Edith Mills. The workhouse closed in 1924 and the remaining inmates transferred to the Union Infirmary (see below). In Deceber 1926, the iste was put up for sale by auction. In 1928, however, it was reported that the workhouse was sufferng from overcrowding and some of the inmates were placed at the Knighton workhouse. Also in 1928, around 80 unemployed youths attended a continuation school run by the Ministry of Labour in six rooms at the workhouse. In 1933, the building was being used an instruction centre, where boys of fourteen to eighteen were taught manual trades. After the Second World War, evicted families were housed in part of the premises. The surviving part of the building is now a mixture of residential and commercial premises including (in 2000) the aptly named "Union Fish & Chip Bar" — the workhouse commonly being referred as "The Union" in former times. 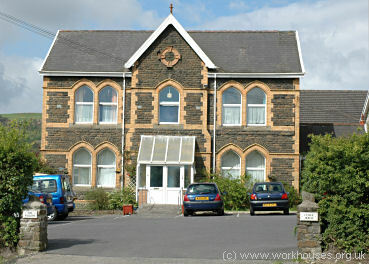 In 2010, the former workhouse featured in the BBC Wales programme "Coming Home" when the actor Michael Sheen learned that one of his forebears spent time in the institution. 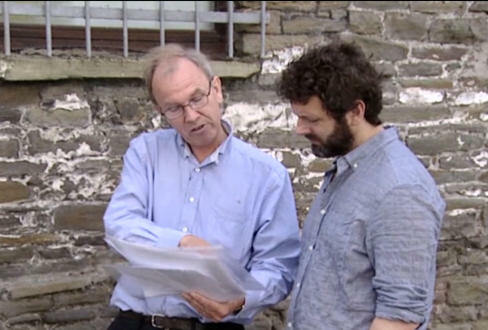 Michael Sheen with Peter Higginbotham at the Neath workhouse, 2010. In 1876-8, the Neath Union erected three cottage homes on a 10-acre site at Bryncoch to the north of Neath. The homes opened in May, 1878, and were able to accommodate up to 40 girls and 30 boys away from the workhouse. The Neath homes were amongst the first poor law cottage homes to be set up in Britain. Census records indicate that there were six homes with around 12 children in each (a mix of boys and girls of varying ages) looked after by an "assistant matron". Neath cottage homes site, 1938. Neath cottage homes from the east, 2005. Only one of the original buildings now survives and is used as a special needs school. The Neath Union erected a separate infirmary on a site to the south of Neath. Its location and layout are shown on the 1921 map below. The infirmary, referred to as the New Graded Infirmary on the 1921 map, had a typical pavilion plan layout with an administrative block at its centre. Corridors led to the male and female ward blocks at each side. A nurses' home stood at the north of the site. 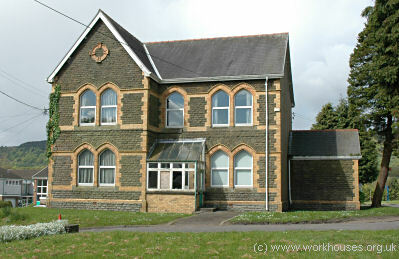 After 1948, the site became the Neath General Hospital which closed in 2003. All the buildings have now been demolished. West Glamorgan Archive Service, County Hall, Oystermouth Road, Swansea SA1 3SN. Holdings include: Board of Guardians' minutes (1853-1930, with gaps); Admissions and discharges (1867-1931); Births register (1871-1931); Deaths register (1871-1932); Creed register (1913-31); Indoor relief lists (1910-1930); Punishmnet book (1914-22); Neath Union Cottage Homes admissions and discharges (1878-1955); etc. Ancestry UK currently has Neath Union Workhouse admissions and discharges (1867-1914); Indoor relief lists (1886-1916); Birth registers (1871-1914); Death registers (1871-1912); Register of Lunatics (1890-1940).